Honor Roll refers to the academic distinction usually bestowed upon students who excel at school. In the context of this 1963 canvas, however, the phrase takes on profound implications. 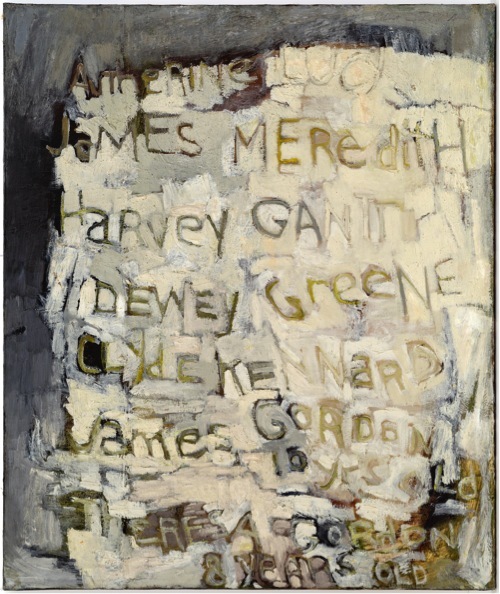 The canvas honors the bravery of seven young African American men, women, and children who were among the first to attempt to integrate schools in the south in the early 1960s. May Stevens renders their names in childlike lettering that looks like it was carved into a tree or wet cement, in the hope that we might remember them. songs to be sung by them and pictures to be painted of them. May Stevens, “Honor Roll,” Blanton Museum of Art Collections, accessed April 26, 2019, http://utw10658.utweb.utexas.edu/items/show/3284.